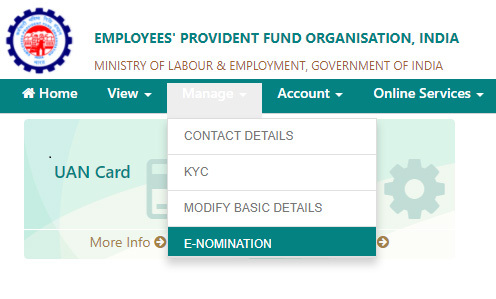 EPFO has recently launched facility of E-nomination on Unified Member Portal. EPFO subscriber can give nomination or change existing nomination by using this facility. If you are EPF subscriber you should use this facility to check and change your EPF account nomination. In this post, we will take a look at the step by step process of using E-nomination facility. The earlier process of changing EPF nomination offline was lengthy and cumbersome. In an old offline process, EPF subscriber was submitting FORM 2 for the nomination. This form was submitted to an employer for authorization. An employer was sending this Form to EPF office for nomination change. The entire process was manual and time-consuming. A new E-nomination facility is faster and it also removes intervention of employer for a change in nomination. Also Read – How to Update KYC EPF UAN Online? Let’s take a look at Steps of using E-nomination facility on Unified member portal. Step 1 – Visit Unified Member Portal – https://unifiedportal-mem.epfindia.gov.in/memberinterface/ and login using UAN credential. In the Manage tab, you will find menu ‘E-nomination’. Step 2 – Click on E-nomination and you will be taken to the Profile Page. Profile page shows your UAN number, Name, date of birth and gender. You need to enter your Permanent Address in the provided box and click on save button. It will update your address. In order to complete this process, your Date of Joining EPF Scheme must be registered with EPF account. In case it is not defined it will not allow you to save address and update nomination. Step 3 – Once you press save button it will update your profile details and prompt you by asking family declaration. Step 4 – On selecting Having Family – Yes, you will be asked to input your family details. Enter Name, date of birth and address. Select a relationship from a drop down menu Relation. Once you are done with the process click on “Save Family Details” button. Step 5 – Next page is of EPF Nomination. In this page, you need to select your family member and provide input for Total Amount of Share %. Step 6 – Once you are done press Save EPF Nomination button. It will save EPF details in your account. Step 7 – Next step is approving nomination by using e-sign. You need to click on e-sign button. It will open popup window asking to select signatory and generate OTP button. You need to click on Generate OTP button. It will send OTP to your Aadhaar registered mobile number. You do not require any additional Digital Signature Certificate. Your OTP consent is enough for signing a document and generating Digital Signature Certificate. After entering OTP your nomination will be registered in your EPF account. As per me, a launch of E-nomination facility is very good step towards digital India. It will surely help EPF subscriber for faster registration of EPF Nomination. If you have not updated your details I recommend to update it now. If you are facing any difficulty in updating e-nomination post your query in the comment section. I will try my level best to solve your queries. « Dividend Mutual Funds Equity Scheme – Should You Invest? Hello I have my father’s name wrong in UAN an d online this facility is not available to be updated. I have already sent joint declaration form to my employer but there is no status update. I am scared if it would take more time than expected. As my father is currently E-Nominee can I change it to my sister ( who is married) or brother in law? and Will i be able to transfer 100% of my PF amount to them to get my money faster as changes in father details will take more time. Also will the claim will again get stuck due to still no change in Fathers name in UAN card. Is it possible to transfer the complete PF amount to the newly added nominee without hassel? during filling E nomination errors occurs “marital status not updated ” how it will be resolved. You need to get it changed from your employer. I do see page E-nominee page. But the form is different than you have shown. What type of form is visible to you? Can you see link of E-nomination in navigation bar? You will not able to update details without Aadhaar.You need to contact PF office offline for nomination update.